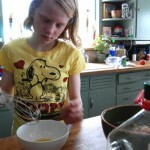 The inspiration for today’s Cooking with Kids! recipe comes from my cousin’s friend Annette Harvey. Both Annette & my cousin live in Australia, where they’re presently enjoying gorgeous summer weather. While on the other side of the world where we live (Portland, Maine), presently snow is falling. Crazy! Whereas Annette and my cousin need refreshing fare to beat the heat, I long for a dish that’ll transport me to a tropical paradise. Funny how well this recipe works both ways! Annette suggested a simpler version of this salad, served alongside seafood. I thought the mango sounded particularly good paired with salmon, so I took the idea and ran with it. 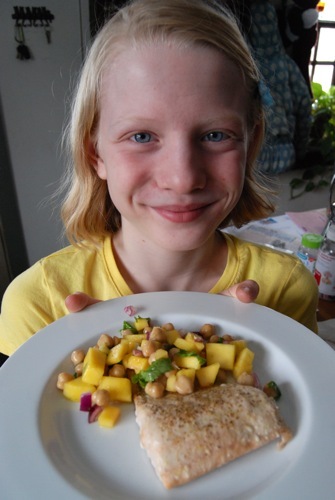 My older daughter (a salmon junkie) thought that sounded marvelous, and other than peeling and seeding the mangoes, she made both. While I sat dreaming of fruity umbrella-laden drinks – hah! 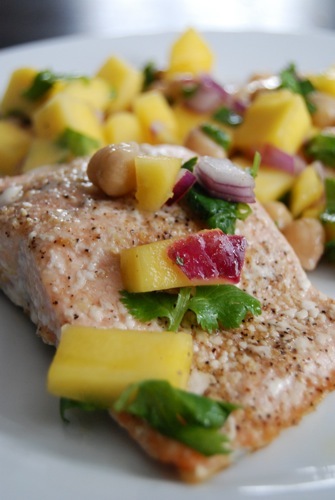 The salad is a zesty medley of sweet and savory, with garlic and red onion, cilantro and chickpeas, lime juice, mango and a touch of agave nectar. The vibrant colors and flavors play hopscotch with the senses. I just love it! The salmon can be prepared several ways, but for simplicity my daughter baked it. 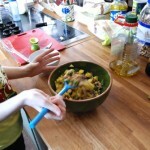 When cooking with kids, less heat = less risk of overcooking + less risk of skin burns = happy! 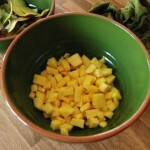 To make the salad, place the mango, onion, garlic, chickpeas & cilantro in a mixing bowl and toss to combine. 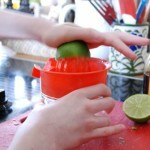 Measure the lime juice, oil, and agave nectar into a small mixing bowl and whisk well. 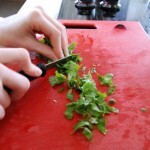 Pour the dressing over the salad, add freshly ground black pepper to taste, and toss to coat. 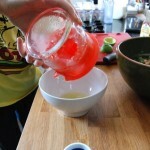 Cover and refrigerate an hour or more to allow the flavors to mingle and develop. 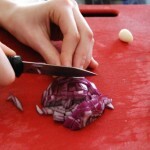 When ready to prepare the meal, preheat oven to 425 degrees. 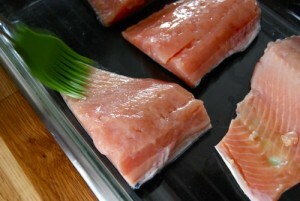 Place salmon fillets in a baking dish. Brush with olive oil. 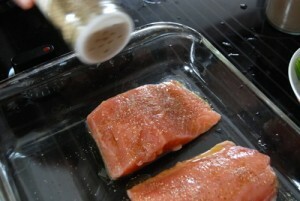 Sprinkle with freshly ground black pepper to taste and seasoning of choice. We used Sunny Spain Salt Free Seasoning Blend from The Spice House and it was fantastic. Place baking pan on middle rack in oven and bake for 14 minutes. 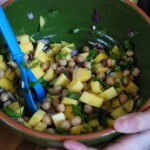 Remove from oven and serve immediately with the mango and chickpea salad. This entry was posted in Salads and Dressings, Side Dishes, Vegan or Vegan Adaptable, Vegetarian. Bookmark the permalink. These are basically all of my favourite ingredients! Minus the fish, of course. But throw some pork or chicken in there instead, and this sounds divine. Christy, was wondering if you could use Brags instead of soy? Hi Tammy! Thanks so much for the link. I have used Braggs liquid aminos in the past. It’s super good stuff. Much lower in sodium than soy sauce, but still too high for mass consumption (160 mg for just 1/2 t.) Used sparingly though it provides great flavor – especially in marinades or stir fry.